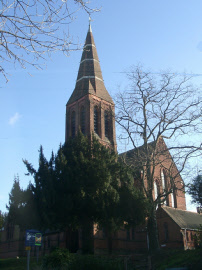 The Vicar of Watford, the Rev'd Richard Lee James, opposed the new parish arguing both that a new church was not needed, and even if it was it should be an offshoot of St Mary's, Watford. He lost the argument. Jonathan King, a builder, after whom King Street in Watford is named, gave over an acre of his land for a new church in Oxhey. The church was built to the designs of Messrs. Coe & Robinson. The construction was largely of red brick and the distinctive spire, with its three bands of white stone, is a familiar landmark locally, as well as to travellers through Bushey on the West Coast mainline. The building is Grade II Listed. There were minor problems, such as the draughts complained of in the May 1880 church magazine and a mistake in the building of the chancel ceiling. The original Vicarage was constructed at about the same time. The design for the church has been altered slightly over time. An extra pair of doors was added at the main entrance to help prevent draughts. The original vestry was converted into the present Lady Chapel in 1891 when a new vestry was built on to the west end of the church. Other changes to the interior were made in 1939, under the direction of Sir Charles Nicholson. The Cancel and Sanctuary walls were whitened and the roof coloured. The original altar and reredos were moved to the north aisle, to be replaced by a stone altar in the English style. Electric lighting had been installed in 1909 and the two original chandeliers were replaced by modern floodlighting. All the donations listed below were generous, given that the average manual labourer of the time earned about £1 a week. Then there was £200 per annum needed towards the upkeep of the church: in March 1879, the Ecclesiastical Commission agreed that a £50 a year endowment be paid and the Rector of Bushey and Exeter College, Oxford promised £50 a year. A capital sum of £2,625 2s 6d was to provide an annual endowment of a further £100. 2,500 David Carnegie, High Sheriff of Hertfordshire, who lived at Eastbury House in the grounds of which is now Northwood Headquarters. 1,000 Thomas Blackwell of 'Cross & Blackwell' pickles, living at Oxhey Place where Oxhey Chapel was located. Bushey station was opened in 1841 and this stimulated the expansion of what was then called New Bushey, to the north of the station. 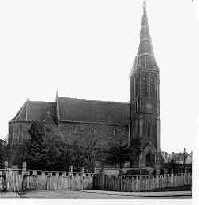 From the 1860s people had suggested that a new church was needed and a site at the corner of Aldenham Road and Chalk Hill was considered. The Rev'd Newton Price, then Chaplain of Oxhey Chapel, with great foresight disagreed, arguing that the district would develop on the unbuilt land to the west of the railway. He urged that the church should be established there and this view prevailed.